Lysa TerKeurst is a New York Times bestselling author and national speaker who helps everyday women live an adventure of faith. 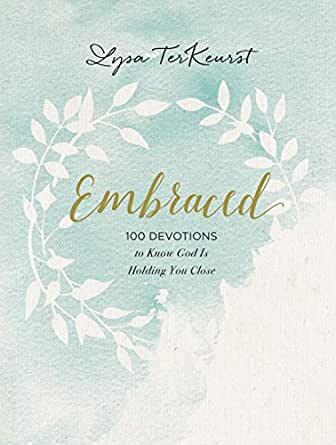 She is the president of Proverbs 31 Ministries, author of 15 books, and encourages nearly 500,000 women worldwide through a daily online devotional. Her remarkable life story has captured audiences across America, including appearances on Oprah and Good Morning America. She lives in North Carolina with her husband and five children. This book is beautiful inside and out! I thank God that His spirit inspires Ms. TerKeurst to know just what to say to our inner pain, questions, self doubt and joy. This book will never make it to my bookshelf, for it needs to be read over and over again. Daily treasure! Things aren't easy for a pastor's wife. This was recommended to me after going through some very difficult times. I'm LOVING reading it each morning. 5.0 out of 5 starsIt's just not me! I'm not the only one to struggle with these kinds of thoughts and questions. Love this Devotional! I have always enjoyed Lysa and her Bible study's. This is the first devotional I have ordered from her and it has been spot on for me. I just Love her open and honest, humble, human stories and results. She does my Spiritual Jesus Girl heart a world of good. Loved this devotional so much I bought one for a friend that also needed some big encouragement. She loves it also. I am rally glad I bought the book. 2.0 out of 5 starsRecycled content. So disappointing! The physical book is beautiful. And I was so excited to have a devotional from Lysa because I love her writing style. However if you read Lysa’s books this is just recycled content. And while it’s great to get a refresher, I was hoping for something new and fresh. Overall I’m pretty disappointed.